Stilettos lose a tip? Western boots need a kick in the shine? 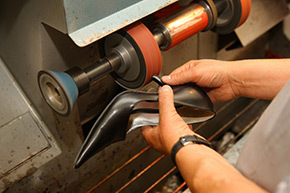 Mobile Shoe Hospital’s shoe and boot repair can help you save those favorite heels, boots, purses and more. Our professional repair techs have over 50 years’ experience in repair and restoration of leather, all types of shoes, cowboy and western boots, leather jackets, even beaded items and an occasional baby doll. Just bring your item in and one of our friendly repair staff will quickly be able to tell you if the item can be fixed. All repairs are prepaid and many repairs can be made while you wait. Be sure to check out our newest men’s western boots and work boots while you’re in the store. We also carry women’s and children’s name brand boots and leather accessories.